Happy New Year! 2016 is in full swing at Eagle Ridge Animal and Bird Hospital. 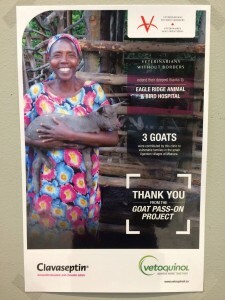 Here’s a run down of what happened at our vet clinic during the first week of 2016. This week we announced the winners of our Holiday Costume Contest. Rush, Alleigh and Eddie won best dog, Loki won best cat, Caramelo won best rabbit/exotic and Maggie won our Facebook Fan Favourite contest. Congratulations to all the winners! They will each go home with a gift basket of goodies. We loved the creativity of all our entries, much to the chagrin of their pets. Getting a kodak moment of two cats can prove to be tricky sometimes. This dynamic duo is Leia and Vader, we loved their names! 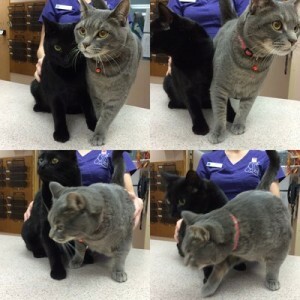 They visited our vet clinic for pawdicures (aka nail trims). Some cats object to this more than others but they were both champs about it! Depending on how often your cat is filing down their nails, they may need to have their nails trimmed every 2 weeks to once a month. It can be a stressful time for both the pet owner and the cat, so please contact us if you would like some pointers and tips to make a nail trim go smoothly at home! Cuteness alert! 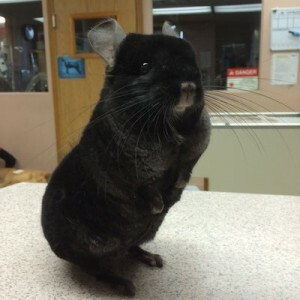 This little ebony chinchilla is Little Boy Blue. He visited Dr. Hardin on Monday for a dental procedure to file down his molars. Small herbivores (rabbits, chinchillas, guinea pigs) are prone to dental issues as their teeth are open-rooted, meaning they are constantly growing. They wear them down by chewing abrasive things, such as hay. If all their teeth are not being worn down at the same rate, their teeth do not meet properly (also known as a malocclusion) and small points begin to form, known as spurs. These can become painful if they are not burred down. This is where we intervene and grind the teeth down to make them even again. It is likely they will need repeat dental procedures in the future to maintain their normal occlusion. Little Boy Blue’s dental issues started in March 2014 and he’s visited us every few months since then to maintain his teeth. He’s a real affectionate little guy, with a a spunky personality to match, and our staff love seeing him. 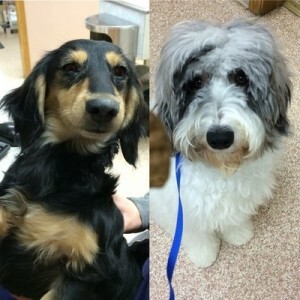 We finished off the week with two adorable dogs who visited our vet clinic to be neutered: Tommy, the long haired dachshund and Murphy, the shaggy Australian shepherd mix. They were both star patients! Neutering your male dog has medical and behavioural benefits. The risk of testicular tumours is completely eliminated and there are fewer prostate problems as they get older. Neutering drastically reduces their testosterone and thus results in decreased aggression towards other dogs and people. Your dog might be less likely to spray urine / mark their territory, and mount other dogs, people and inanimate objects. They will also not want to roam when they sense a female is in heat, so you won’t have to worry about your dog fathering an accidental litter and contributing to overpopulation. Although the decrease in testosterone may fix behavioural problems associated with an increased level of testosterone, neutering may not eliminate all behavioural problems if they have become habitual.